The Steering Board on Disaster Prevention decided to posthumously awarded certificate of merit to reporter Dinh Huu Du who was swept away in stream while he was taking photos of the flood. To honor his example, the steering board decided to posthumously award him certificate of merit signed by the Minister in a meeting yesterday. 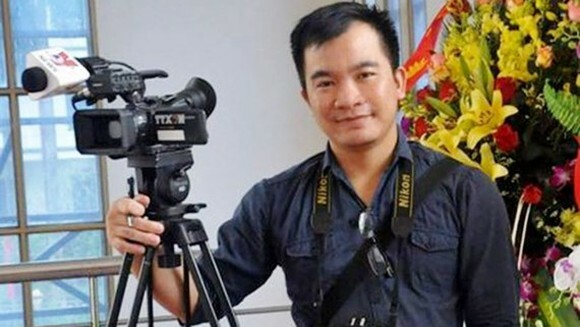 Dinh Huu Du was swept away while standing on Ngoi Thia bridge to film the flood in Nghia Lo Town, Yen Bai Province, when parts of the structure suddenly collapsed. Dinh Huu Du was born in 1988 in the northern province of Ninh Binh. Deputy Prime Minister Truong Hoa Binh had proposed the government to give award to the passed away reporter. People’s Committee in Yen Bai province had awarded certificate of merit to him. Party Secretary of Yen Bai Pham Thi Thanh Tra said at a meeting with the Deputy PM that Du is an active and good reporter who voluntarily arrived in dangerous areas to cover ravaging storm to readers early. For instance he is the first reporter who made photos flash flood in Mu Cang Chai District in August.